I’ve been overweight my whole life. My whole family was overweight, and looking at my family tree, my parents parents were both overweight and my aunts and uncles struggle with their weight also. Partly genetic and partly unhealthy habits, weight issues are part of my family history. My weight struggles have very much been part of my life for as long as I can remember. I was the fat girl in gym class. I did participate in sports but I struggled to run and keep up with the other kids. I’ve always been self-confident but down inside I felt bad about my secret binge eating. I didn’t have one turning point moment but rather a series of events. My stomach hit the steering wheel when I sat down to drive — and I wasn’t pregnant. One morning my toddler daughter asked me why I was eating ice cream for breakfast when she wasn’t allowed to. I realized I would very soon be passing my unhealthy habits on to my children if I didn’t make some serious changes. Rather than start another diet (I had dieted many times before), I found a therapist who specialized in eating disorders, and that was what made the difference for me. I didn’t even try to lose weight at first. I focused on getting my thinking straight and working on my relationship with God. Once I had been in therapy for 6 months, then I joined the Weight Watchers online program. 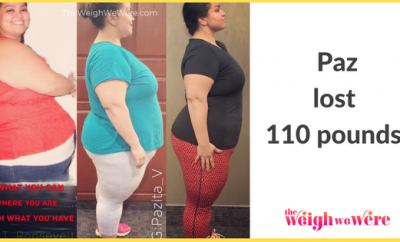 The first week after I started Weight Watchers I lost 2 lbs, which surprised me because I was eating a LOT and still binge eating, but it was still less than what I was eating before. 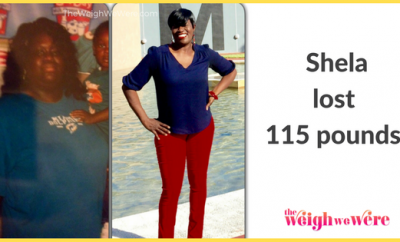 Each week I steadily lost another pound or two. I didn’t tell anyone what I was doing, I just kept at it quietly. 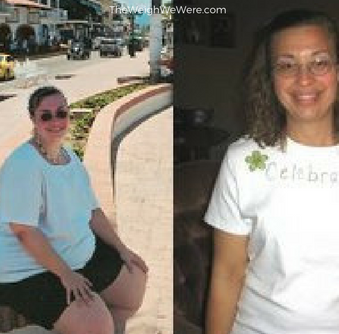 Since I was so heavy, it wasn’t until I had lost about 50 pound that people began to notice. When people noticed, I enjoyed and feared the attention. I’m a busy mom to 5 children and we were foster parents to 35 children over the course of 6 years. Most of our foster children were medically fragile and all had very high needs. The stress was unbelievable. I had to start taking care of myself. It was incredibly tough to step away from all of our family demands (even getting up early to go to the gym after caring for newborn twins on oxygen throughout the night), but I did it. I learned I had to care for myself so I could be there for my family. Before I lost weight, I was having terrible stomach pains from stress and eating binge eating. After I started eating better, the stomach pains went away and I had renewed energy to face each day. 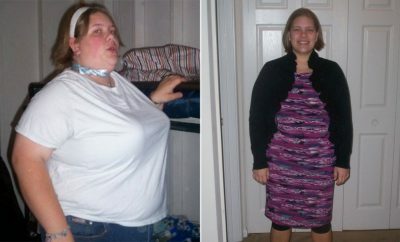 After I had lost 80 pounds, I hit a major plateau and didn’t lose any more weight for a year. That was so painful, but it was also necessary for me to learn more. I switched from the Weight Watchers system to using a fitness tracker (The Body Bugg is what I used at that time). I learned so much about how and when I move, and that I needed to move more during the day, not just when I’m exercising. From using that, I lost the last 20 pounds. I’ve had hundreds of non-scale victories. I have more confidence, peace, and a joy in life that I never had before. There is a contentment that surrounds me that is impossible to describe. My weight issues had defined me for so long. I truly thought I would never overcome this problem. 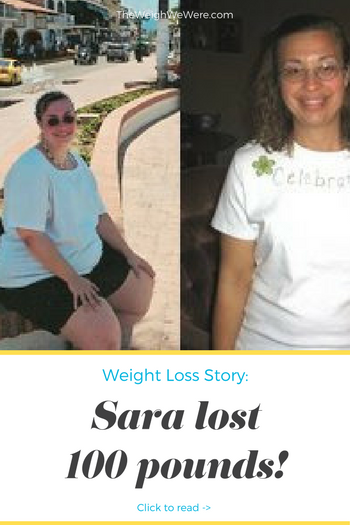 To have achieved this weight loss — and even more so, maintained for the last 10 years — is an amazing accomplishment. I was a compulsive over eater and binge eater. In front of other people, I ate healthy food, but in secret I binged on massive amounts of junk food, like cartons of ice cream, whole bags of chips, and boxes of Drumsticks ice cream cones. Once I started eating, I would eat until I was physically sick and could not eat another bite. I used to hate exercise with a passion! I didn’t exercise at all when I first started losing weight. I started with walking around my neighborhood, then I joined a local gym. It was so difficult to walk in those doors for the first time. I worked with a personal trainer and learned how to lift weights. Then I got the idea that maybe I could walk/run a 5K. The night before my first 5K, I was so nervous I didn’t sleep at all. When I crossed that finish line it was a total high! I walked/ran more 5Ks, then a Half Marathon, and believe it or not that led to triathlons and even a Half Ironman! Sometimes I can’t even believe it myself. Find an online support group. Try different ones to find one that is right for you. Maybe it’s a weight watchers group or maybe it’s moms who are losing weight or women who have chronic pain who exercise. Find your people, and not ones who are complainers — ones who will support you in getting healthy! Hide junk food from yourself. I put Christmas cookies in my basement and chocolate deep in my freezer or high on a shelf where I can’t see it. Sometimes I actually forget it’s there, and at the least I have to work hard to get it, so it forces me to stop and think about what I’m doing when I go for it. Make exercise and healthy eating such a regular part of your routine, it feels weird when you don’t do it.